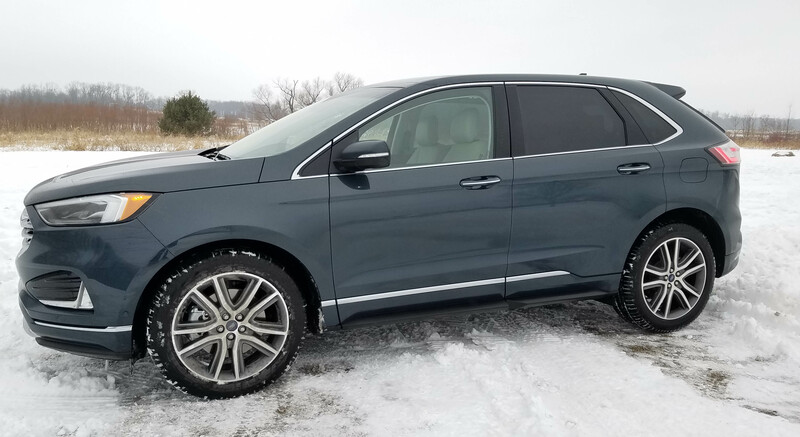 Ford revamps and upgrades its popular Edge mid-size crossover for 2019, discarding its V6 for a twin-turbo I4 and a new 8-speed automatic transmission. 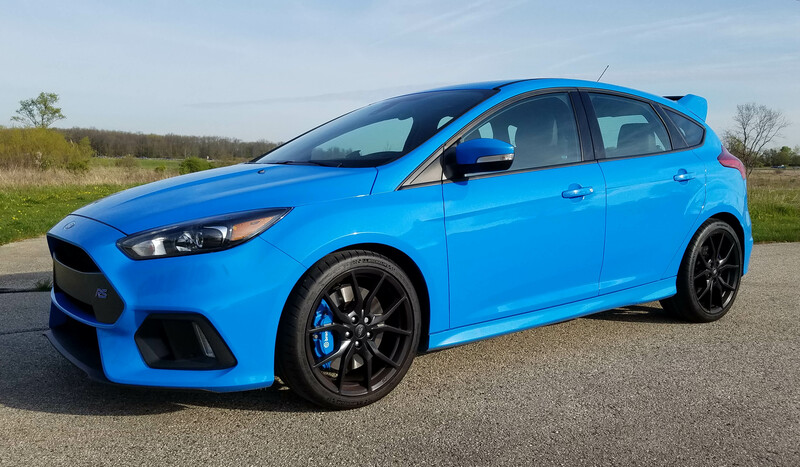 Simply put, Ford’s Focus RS is a street-legal race car. Not many of those out there, and most that are require you to sell your house in order to make a down payment on said speedster. So here, for “just” $36,995, Ford will put a scorching hot rod, drifter, rally car in your driveway, enticing neighbors, especially young males, to drool. It’ll also increase your heart rate, something on the order of being a real race driver. The backstory on the German-made RS is that it, or similar Foci, have been sold in Europe for years and U.S. lead-footers have been itching for it, begging for it, praying for it to hit our shores. Now it has. I don’t know how many will be sold, but the Subaru Impreza WRX now has serious competition. In fact, folks considering a Chevy Camaro, Ford Mustang or Dodge Challenger may want to consider saving some dough and going this route for serious performance. What does that performance consist of? 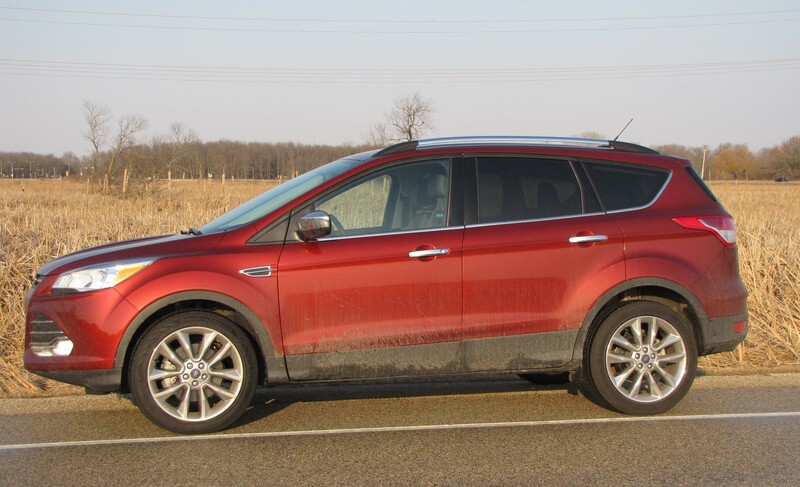 Ford refines its Escape crossover . 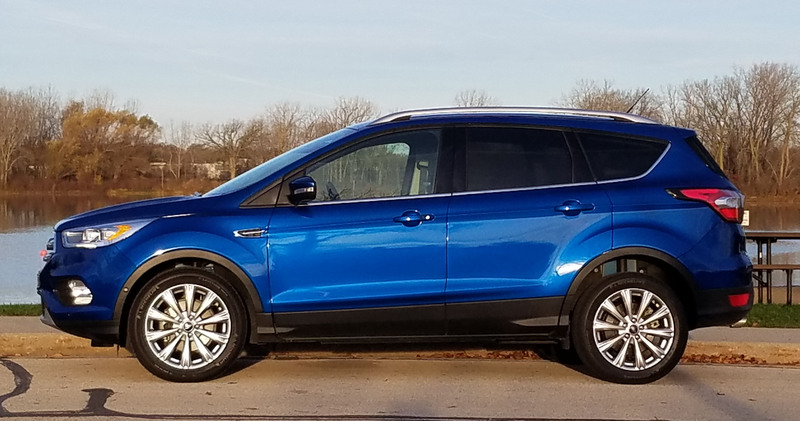 . .
For 2017 Ford has restyled its popular Escape inside and out, plus developed two new engines for the entry-level sport-utility, er crossover. There’s no mistaking the Escape for something else as its profile remains much the same, but there’s a new hexagonal grille, LED trim headlights and revised tail-end styling. Overall the look is a bit more upscale, which is ironic because Escape remains very much a low-end to mainstream crossover for a family of four. 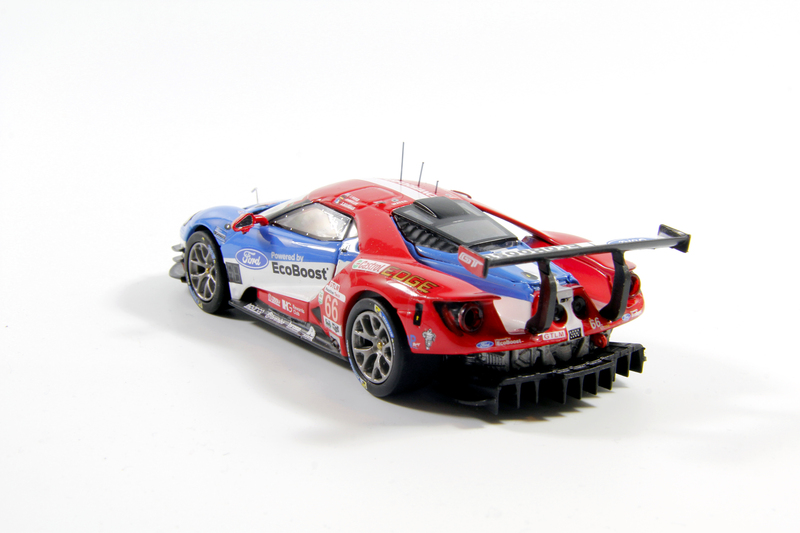 It’s roomy and comfortable and the new 1.5-liter I4 EcoBoost engine in the tested top-tier Titanium model is stellar. Pricing and gas mileage also are in Escape’s plus column. Let’s start with acceleration, which is excellent with the new turbo I4 that delivers 179 horsepower and a similar 177 torque rating. Escape is quick from a standing start and the fine 6-speed automatic shifts easily and smoothly. Dirty week of snow and slop added some grit and grim to the pretty red Escape, but it handled like a dream all week. 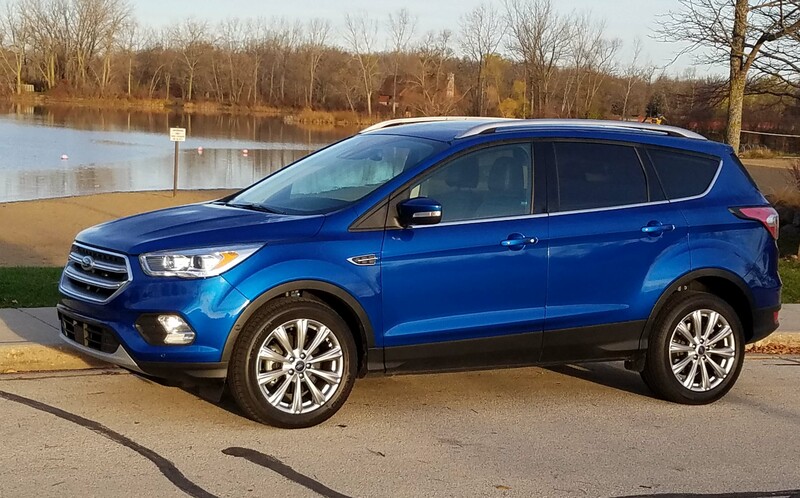 Ford’s Escape is popular because it looks good, comes in a range of prices that meet a wide array of consumers’ needs, and is an extremely sporty handling crossover. 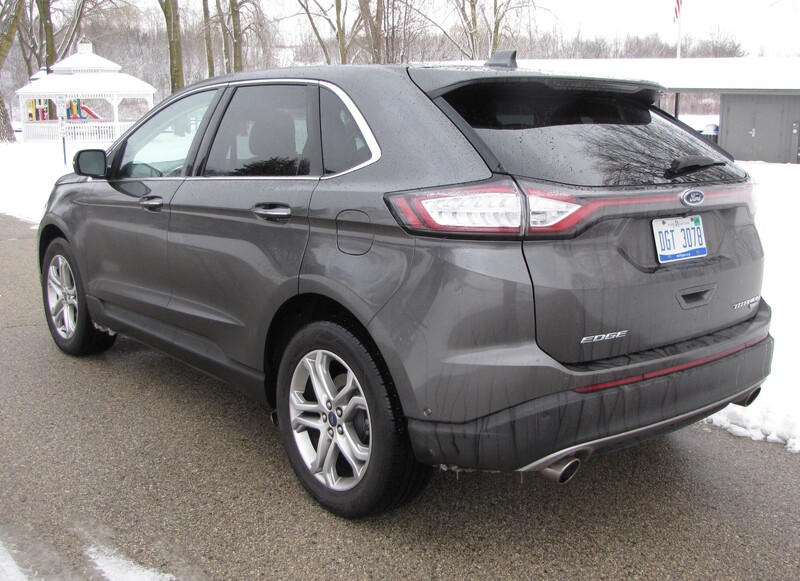 Ford’s Edge is a good looking crossover that puts Ford’s boxy Flex to shame in handling and looks , but won’t haul as many people. 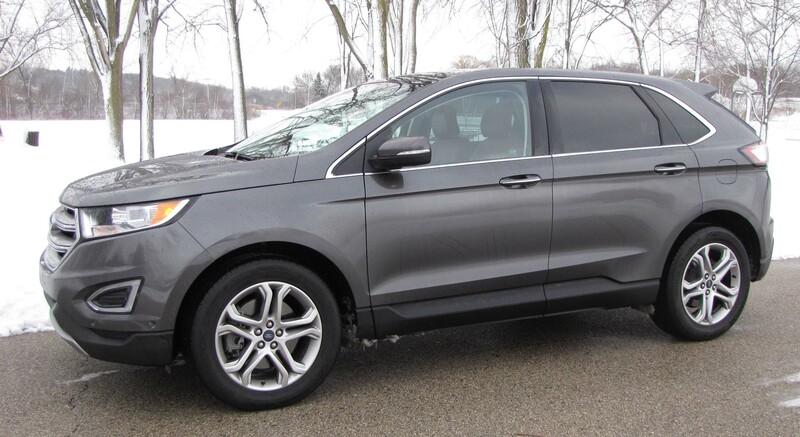 Edge is a top-flight mid-size crossover with a comfortable ride, good power and an excellent interior for five adults. My test unit was the almost top-level Titanium model with all-wheel-drive, so started at $38,490, including delivery. Only the Edge Sport is more upscale, starting at $40,990 and packs a turbocharged V6. I found the metallic gray (magnetic) test Edge’s turbocharged 2.0-liter EcoBoost I4 to be sufficient. It delivers a healthy 245 horsepower and boasts a 270 torque rating. So it’ll get up and go. Besides you’re not gonna take a crossover to Union Grove’s dragstrip anyway. 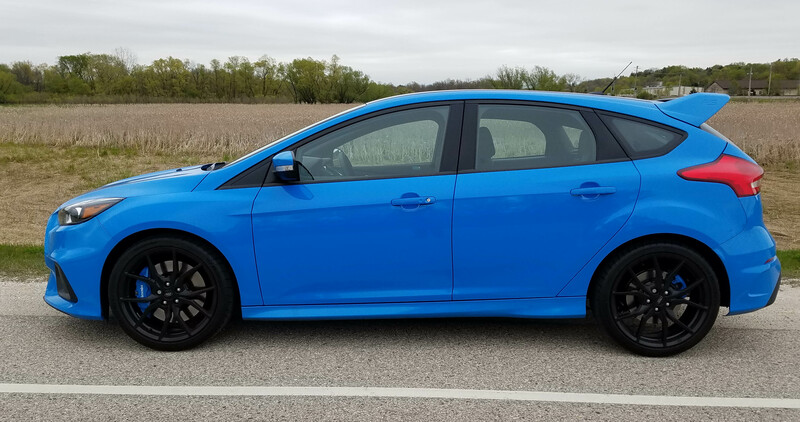 Ford’s EcoBoost engine works well with the standard 6-speed automatic, runs smooth and quiet and when you tromp the accelerator to get on the highway it’ll jump up to 70 mph quickly. Edge also gets away from stoplights well in town, not feeling as heavy as it’s nearly 4,100 lbs. 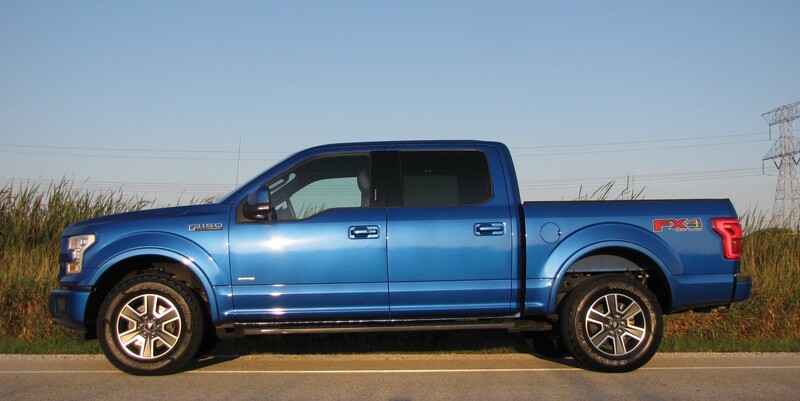 The Ford F-150 has been the best-selling vehicle in the United States virtually forever and there’s a reason for that, it’s a darned nice truck. Now that it has an aluminum body and notwithstanding the funny Chevy commercials poking fun at it, it’s even better. It’s lighter and more fuel efficient and at least from all outward appearances, just as strong and reliable as in the past. Chevy can tweak Ford all it wants, but over the past several years Ford has come up with a series of new Ecoboost engines that are high horse, high torque and more fuel efficient. Now it lightens its pickups by roughly 700 lbs. by developing high-strength aluminum for the bodies. Hmm, sounds to me like a leader protecting its lead! 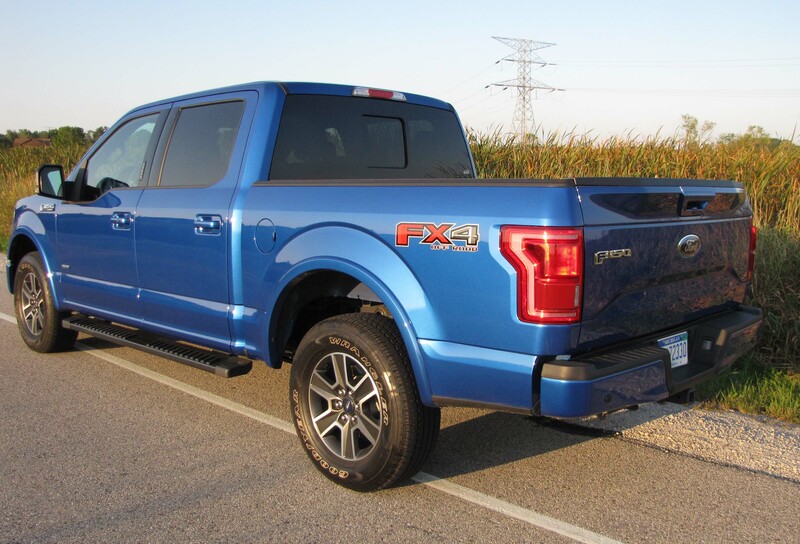 Let’s make no bones about it, the bright blue (blue flame metallic) test truck, a 4×4 SuperCrew was still plenty heavy, tipping the scales according to Ford and other automotive test sites, at nearly 4,700 lbs. But that’s about 900 lbs. lighter than a Toyota Tundra I tested earlier this year and a several hundred pounds lighter than a similar Chevy Silverado. That does help fuel economy, which I realize is of minor importance to some folks now that gasoline has dropped back below $3 a gallon. But it’s a money saver over the life of the truck, and, one could argue, better for us all.